Well, my plan was to rise early to get some writing done. Because this day before thanks giving is going to be full of activity. I don’t have guests coming here but I need to prepare pies to take to my sisters. I have a chiropractor’s appointment this morning because it had to be moved from Monday. Having a new grandbaby is a great reason to move it. And then there is my monthly hair appointment. I almost slept in. I felt so lovely not to have to get up at 4:30. Well, I managed ten extra minutes. 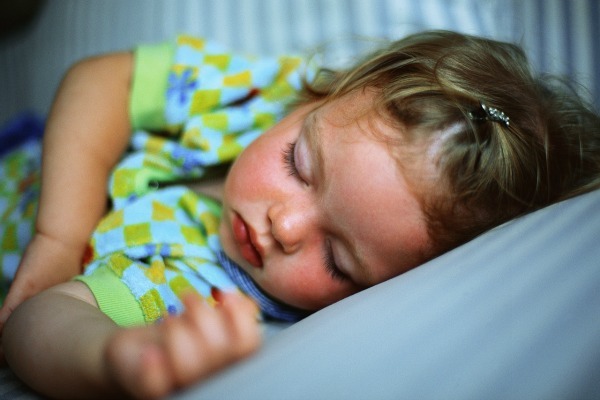 My six year old granddaughter woke me with tummy trouble. After some Imodium she is resting on the couch while I set at the other end typing this blog. I have plans to finish other writing projects. Those are temporarily shifted in priority while I put musing that have taken over my mind with my granddaughter’s early morning need. Write where you can when you can. Often ideal moments never come. I am most productive early morning because by 9pm my brain is fried of all creativity. On my days off three or four hours of early morning writing is a blessing. On work days 20 or 30 minutes of vomiting thoughts on a page gives me a feeling of exhilaration. There are times I take my laptop to a different location in my home to work. I’ve sat near the grandkids while they play. Wrote during commercials during family time. (This is the get the thoughts on paper kind of writing). Nothing really creative happens while your brain multi-task between TV and word craft. My laptop may sit on the kitchen table while I pop something in the oven for dinner. Staying near the oven to actually hear the timer is preferred to hearing the smoke detector from my office. If the grandchildren insist on helping me cook the laptop remains ideal in my office. I have a rolling desk in my bedroom. I can use it while propped up in bed which is a great place to stay when I don’t want any interruptions in the afternoon or early evening. My room is off limit to all family members. Except my hubby who lately has decided that’s a great time to take a nap or look as FB on his phone. The sound of snoring or chuckling become background noise to my writing process. When my back is sore from all the sitting I use my kitchen counter to get a few paragraphs on paper. That’s often the time I clear out my email, make comments on blogs I follow and post FB status. At least in those moments I’m growing my internet footprint and working on my platform. My work uniform pockets, on slow days, often fill with scrapes of paper. 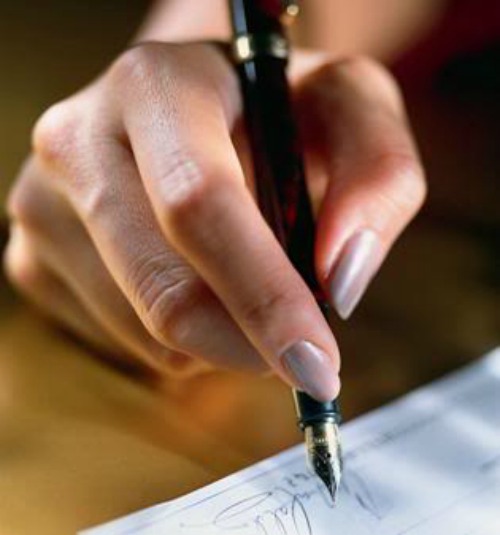 Each containing either a writing to do list, a great line, story premise or a rewritten scene. My little notebook may come out in the car, the doctor’s waiting room or during a sermon to jot down the words, ideas and visions floating around in my head. Because my writing life is rarely without interruptions I’ve learned to grab the time as I can. Whether pockets of time throughout a day or early morning watching over a sick child grabbing those moments gets me that much closer to completing my goals. Getting paid to do the thing I love and share that love with as many people as I can. What is your writing goal and how do you find time to write toward that goal? 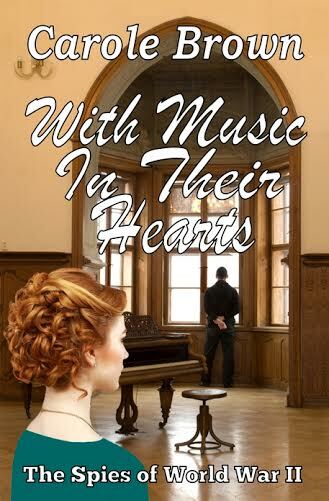 I loved With Music in Their Hearts and am so honored Author Carole Brown agreed to an interview. She will be sitting down with me next month to share about the creation of this novel and her writing journey. I am so excited I thought I’d share a few things to wet your reading appetite. Hopefully, get you as excited as I am about the interview. So I am sharing the review I post on Amazon, the back cover copy and an excerpt from the first chapter (Carole gave me permission) to generate some interest in this fascinating novel. I opened to chapter one in my Kindle and heard the music coming from the piano at the boarding house. I felt a part of the intrigue and saw the characters as they interacted with one another. Carole Brown’s World War II spy novel With Music in Their Hearts is a fascinating read. The realistic dialogue, setting and characters dress drew me into this 1940’s mystery. Americans spying on Americans during a turbulent time in history perked my interest. Make that spy a pastor and add some romance and I was fully engaged. The character’s reminded me of an old black and white movie from the period especially the way the men and women flirty and behaved. Carole is a gifted writer and meticulous researcher. Both talents show through in this page turner. Some may refer to it as cozy because there isn’t a lot of graphic violence. But the suspense still rings true. Lovers of World War II historicals aren’t the only ones who will enjoy this novel. If this time period is not your normal fare give With Music In their Hearts a look you won’t be disappointed. corner, gravel crunching and spinning into the air. forward. Tyrell flung himself at the car and grabbed for the door handle. The car spun around a far corner, and Tyrell reached up to rub his stinging arm. The sticky wetness drew his attention. and they’d been close enough to kill him if they’d wanted to. They didn’t want to. What were they after? A scare tactic? To warn him away? From what? Perhaps all this was a coincidence, a figment of his active imagination. Tyrell hesitated at his own door, next to her’s, but inserted his key and entered. Inside, he switched on a light then as quickly flicked it off. He stepped to the window. Oldsmobile. Standing beside the car staring up at the hotel, stood Ben Hardy. If you’re curious enough to add this to your reading list I hope you will stop by on Monday, December 1st to see the interview with this wonderful writer. By the way it is available in e-book format as well. 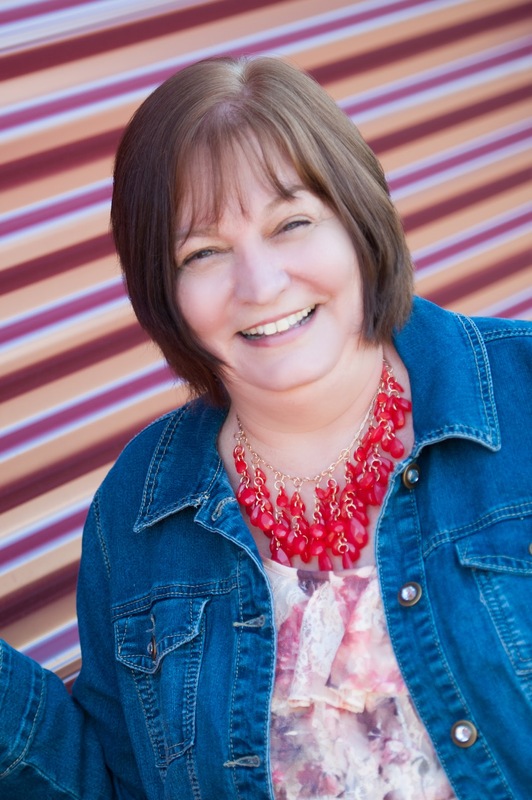 Carol McAdams Moore has written two delightful devotionals for tweens. That’s 8-12 year olds if you want to know. This is the age where drawing, coloring and lots of glitter are the best ways to express feelings and tell tales. These books would be great for Sunday School teachers to gift their class to encourage person devotions. Oh, where were these kinds of books back when my children were young. Parents with sons who hate to read or don’t seat still for long devotional reading will find a fun place to explore God’s Word in Dare U To Open This Book. The title of Carol McAdams Moore’s devotional for tween boys takes that dare to fun places. Ninety days of scripture and what if questions to spark boys imaginations. Chances to doodle and expand the concepts creatively, no essay writing involved. Lessons are short allowing the reader to take as much or as little time as he feels inspired to with each lesson. If you are looking for a fun devotional for your daughter that challenges their thinking without a lot of boring fill in the blank questions have I got the book for you. 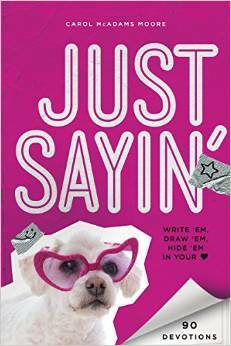 Just Sayin’ is Carol McAdams Moore’s devotional for tween girls. It’s jam packed with 90 fun activity pages. Every page has a verse and spectacular ideas to ponder. Laid out like a scrap book it has short, sweet and creative daily devotional pages. Lots of markers, glitter and gel pens are needed to doodle and create answers to the questions for each day. Perfect for girls to visualize the truths of God’s Word without using a lot of words. I‘ll be interviewing Carol soon about all things devotional. If you have any questions I’ll pass them along for you. She’s also having a drawing to giveaway these books to some lucky commenters. Don’t forget to click the subscribe button to follow me. Ben Wolf is his own hero and villian. 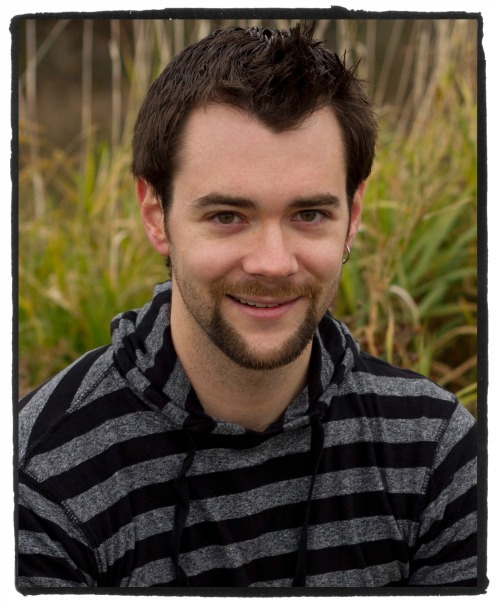 Today I welcome Ben Wolf, owner and founder of Splickety Publishing Group, to my blog. I met Ben Wolf at a writer’s conference a few years ago and have watched his career grow from there. After reading his debut novel Blood for Blood I wanted to invite him to take a seat in my very cluttered office to share a little about how he decided on his theme. For those of you who have not read my book review let me give you the one second recap: A vampire gets saved. Kind of weird yet intriguing at the same time. Hey, that kind of describes you, Ben. Let me clear off that chair over there and we can get started. Tell my readers a little bit about yourself. The normal along with the weird. Hi, Cindy. I’m both the hero and the villain in my own story, which makes for some interesting sword-fighting duels in my sleep. As you said, I’m the founder/owner/Executive Editor of Splickety Publishing Group, your source for the best flash fiction in the world. When I’m not working on Splickety stuff, people pay me small fortunes (emphasis on small) to freelance edit their writing, whether it’s nonfiction, fiction, or just about anything else. I’m also the author of Blood for Blood, as you said in your delightful introduction. And yes, a vampire does get saved. The story focuses on what happens to him after that experience, specifically on how he tries to stop becoming a vampire and how other Christians treat him. It’s obvious to anyone who meets you and follows you on Facebook that you write and love speculative fiction. How does this genre fit in the Christian market? For readers who don’t know what spec fiction is, it’s anything weird: super heroes, vampires, aliens, fantasy, sci-fi, Steampunk, paranormal, supernatural and much, much more. As to its place in the Christian market…most of us are still trying to figure out exactly what that is. Right now the Christian market is dominated by romance and other inspirational genres (including historical). Suspense/thriller/crime/mystery stories are also up there, probably ahead of speculative fiction. But that’s rapidly changing. Very, very rapidly. We’re poised to take over, and it’s going to be amazing. Within the next 10 years, I anticipate that you’ll see more and more Christian spec fiction (or just spec fic in general) on your bookshelves, and more on Amazon.com and other online retailers as well. The younger generation doesn’t go in for romance stories like previous generations have—they grew up with spec fic in pop culture, so that’s what they love. That’s what they write, that’s what they read, and that’s what they’ll be buying. Blood for Blood centers around a vampire. Why vampires? Vampires, in their traditional form as set down primarily by Bram Stoker in Dracula, are diametrically opposed to everything that Christianity stands for. My friend Matt Sheehy, also an author, suggested to me that a vampire getting saved would be hilarious because of all the various vampire taboos he’d have to face as a result. I did a 10-part blog series on the particulars of what my main character Raven endures after he becomes a Christian and why vampires are vexed by Christian principles. Beyond that, I wanted to explore the question of whether or not a vampire even could be saved. Traditionally, vampires don’t have souls. Therefore a vampire can’t be saved. However, we serve a God who is capable of doing the impossible. He raised Jesus, Lazarus, and others from the dead, and in Psalm 23 King David talks about God “restoring his soul,” so add a bit of fiction to it and hey, maybe this could actually work out. An Italian evangelist was a surprise to me. Not your stereotypical minister. Talk a little bit about him and his goals. Luco Zambini is the Italian evangelist in the story. He sort of takes Raven under his wing and tries to help him walk in his new faith. It’s unusual for an Italian in this time period to be non-Catholic, but not impossible, so Luco is an example of an exception. The fact that he’s Italian comes into play when Raven accidentally eats pasta sauce at Luco’s house that contains garlic. Long story short, Luco’s intention is to prove to his congregation and his family that Raven is capable of genuine change because God is capable of inspiring that change. It’s his hope that Raven’s soul will be fully restored and that he’ll be able to walk in daylight again, just like normal humans do, and just like raven used to do when he was a human. I found your theme compelling. This coming from a non-vampire reader. Psalms 23:5 is your focus scripture. The restoration of a soul is a wonderful thing. But taking it to the extreme of a soulless man was genius. Now that I’ve totally stroked your ego tell us what this verse means to you personally. Thanks. My ego and I will sleep well tonight. For me, Psalm 23 (the entire chapter) was something my parents recited with me every night before bedtime when I was a kid. On some level, it must have stuck with me. The imagery of King David’s poetry is powerful and loaded with meaning beyond just the beautiful prose when you understand the context of some of the things he’s saying. Suffice it to say that we all venture into that valley of the shadow of death at times, and we all need the Lord to guide us, me included. Psalm 23 is a great reminder of that. This book is written with the new adult audience (young people in their 20s) in mind yet I haven’t seen that decade in a while and I enjoyed it. Pretend you’re speaking to a room full of people my age and share with us why we would find value in reading this story. As for reason number two, it is beneficial to know what folks of all ages are reading. 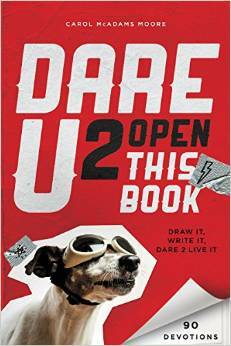 If you’re not in that new adult range and you’re a YA reader, this book will still appeal to you. If you’re older than that new adult range, then you probably know some younger folks who would get a kick out of this book and other books like it. If you’re a parent or a grandparent to someone in the new adult or young adult range, then read this book to screen it for your loved ones, or just get it for them because it’s bound to be right up their alley. It’s been great visiting with you and before you go can you share with my readers about Splickety’s magazines and how they can subscribe. Don’t forget to mention the anthology. And please feel free to promote yourself shamelessly. Splickety always has some sort of deal going on, and right now so do I. Subscribing to Splickety’s magazines is as easy as visiting our website, clicking a few subscribe buttons, giving us your info, and then paying via PayPal. But there’s a better deal going on that isn’t currently on the website. Right now, you can get a digital copy of my novel Blood for Blood AND a one-year digital subscription to Splickety’s magazines for $19.95 if you email me with the code B4B1995 at 1BenWolf@gmail.com. I’ll then provide instructions on where to mail the payment (or we can do PayPal) and we’ll make sure we get you signed up. Normally the subscription alone costs $24.95, and Blood for Blood sells on Amazon for $4.99, so you’re saving about ten bucks with this deal. As Cindy said, our first-ever Splickety anthology is coming out soon as well, and that’ll be available for purchase soon after the new year rolls in. If you’re looking for an editor, for consulting, or for a great public speaker, check out my website at www.benwolf.com, contact me, and we can talk about those things at your leisure. I want to add how much I enjoy Splickety magazines. Great flash fiction coming to your email or mail box every month. As Ben suggested check it out. 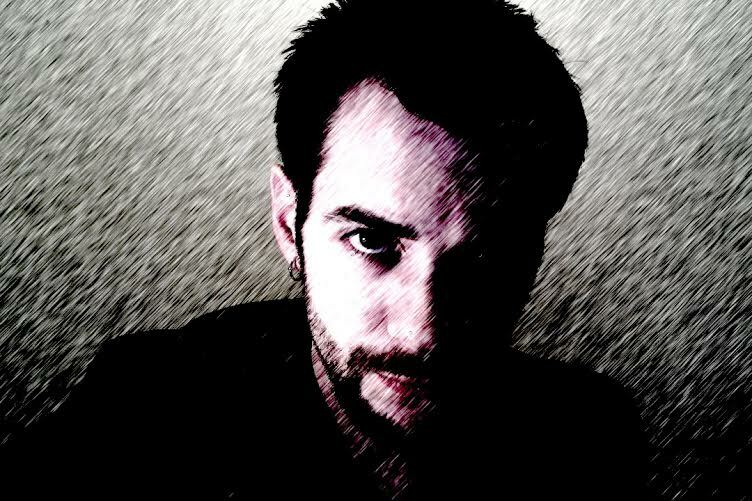 If you have any questions for Ben about his writing process, writerly things or vampires leave a comment. To subscribe to my blog click the button on your right. 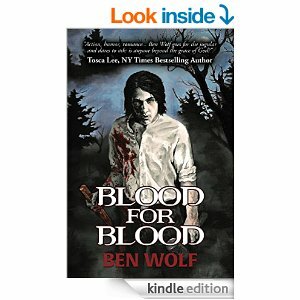 Blood for Blood the debut novel of Ben Wolf is not the sort of book I would normally read. But its unusual premise intrigued me. Psalms 23:3 He restoreth my soul is the theme verse for this new adult novel. (Adults in their 20s). This novel set in the 1800s isn’t focusing on any old body’s soul but a vampire. That part gave me pause I don’t read horror and never followed Twilight or any of the TV shows available today that feature vampires. But in the pages of Blood for Blood I found so many wonderful examples of the redemptive work of Christ. Reminders of how Christians judge the validity of someone’s salvation based on the level of sin in their former life. Evangelist Zambini believes God can restore anyone’s soul and when he draws the soulless vampire Raven Worth toward the truth of God’s word interesting things happen. This author researched the folklore of vampirism and used his findings as a great foundation for the struggles of his protagonist. Those struggles parallel our very human Christian walk as Raven grows in faith and out of his vampire life. There were surprise plot twists and the villain was not who I expected. Well-written and captivating. If you enjoy D L Koontz and Ted Dekker you will enjoy Blood for Blood. Even if you are an anti -horror reader like me you will find this story compelling and entertaining. If you are paying attention you’ll probably find a few choice nuggets of truth to meditate on as well. Because this is so out of my wheelhouse when it comes to reading preference I wanted to pick the brain of this debut author regarding the creation of this story. Look for an indepth interview with Ben next week. Please use the button on your right to subscribe to this blog.